There are many similarities between Blue Cone Monochromacy and Borholm Eye Disease, a retinal X-linked disorder that seems nowadays due to Single Nucleotide Polymorphism (SNP) mutations in the OPN1LW/OPN1MW genes. Bornholm Eye Disease is an X-linked disease and the aspects that characterize it are High Myopia with Cone Dysfunction and Color Vision defects. 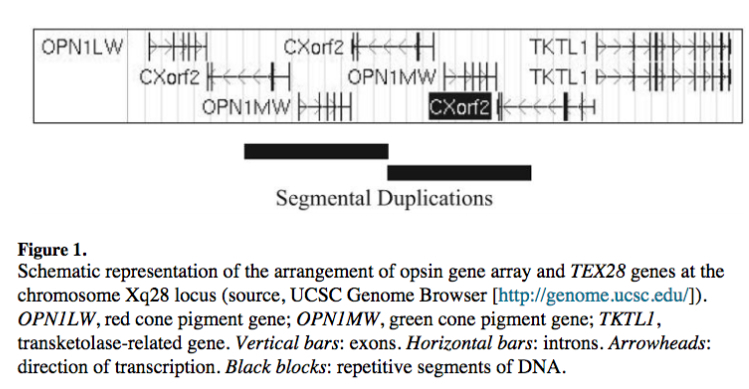 •	Mutation on the OPN1LW/OPN1MW genes. The history of this disease has been complicated by the difficulty of highlighting its genetic origin. In fact, as to date it is believed, this disease is caused by a rare mutation consists of a set of point mutations (Single Nucleotide Polymorphism SNPs) on one of the 6 exons of the opsin genes (Exon 3). This kind of mutation can result in a ‘splicing’ defect of the opsin proteins and can give rise to cone disfunction and color vision. It is not clear nowadays how myopia results from this mutation, although myopia is a common feature between Bornholm Eye Disease and Blue Cone Monochromacy. Originally described in a large family from the island of Bornholm in Denmark with deuteranopia, and later in several families with protanopia, there is a first type of this cone dysfunction that is associated with loss of function mutations in the cone opsin array and it is named Bornholm Eye disease (BED). Haim et al. (1988)  and  described a large Danish family, from the island of Bornholm, with X-linked myopia conbined with astigmatism, impaired vision and deuteranopia. Symptoms were present in all affected males. Myopia was diagnosed at 1.5 to 5 years of age. The syndrome was traced in 5 generations of the family. Young et al. (2004)  reported a Minnesota family of Danish descent with a similar X-linked phenotype.The only difference between the Minnesota family and the original BED family was the color vision defect. Whereas affected members of the BED family had deuteranopia, those affected in the Minnesota family had protanopia. Up to this point was not clear if this was a new form of X-linked disease with high myopia and non-progressive cone disfunction and whether color vision problems were unrelated or not. Infact Bartsocas et al. reported evidence of a family with X-linked high myopia without other colorblind symtoms. The disease maps to chromosome Xq28 and is the first designated high-grade myopia locus (MYP1). In this position Hanna et al. 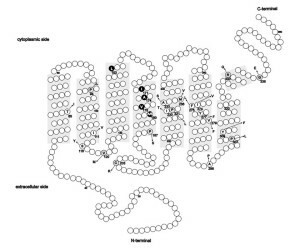 (1997)  determined the existance of a gene named CHROMOSOME X OPEN READING FRAME 2 (CXORF2) or TEX28 gene that contains 5 exons. It is transcribed in the orientation opposite to GCP and TKTL1. By genomic sequence analysis, Hanna et al. 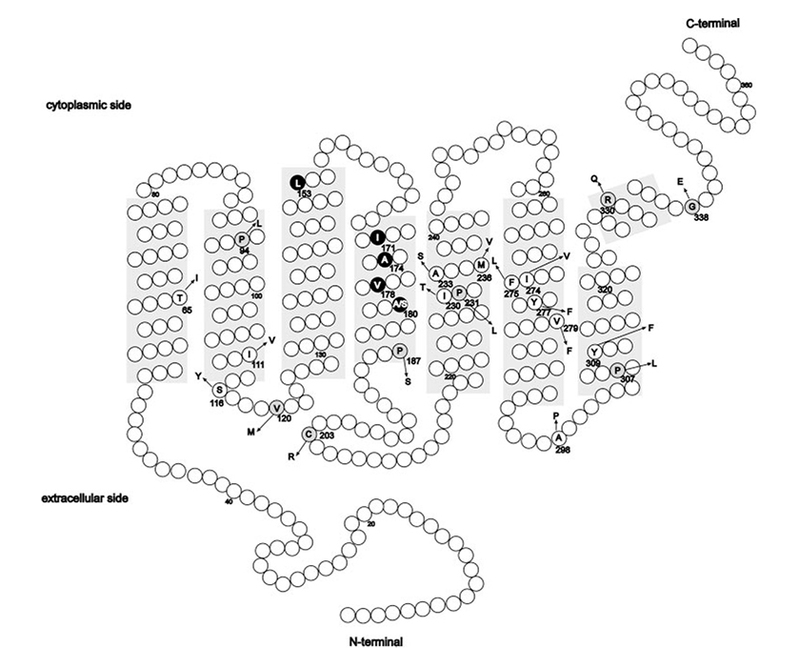 (1997)  mapped the TEX28 gene between the GCP and TKTL1 genes on chromosome Xq28. They determined that TEX28 is repeated multiple times within the color pigment gene array on chromosome Xq28, but exclusion of exon 1 from the duplicative copies suggested that transcription is restricted to the copy between the GCP and TKTL1 genes. Hanna et al. (1997)  suggested that color vision disorders that result from deletion of the color pigment genes should be reappraised for possible associated phenotypes that might derive from disruption of the TEX28 gene. Chen et al. (2006)  determined that there are 3 exact copies of the TEX28 gene on chromosome Xq28. Metlapally et al. (2009)  studied copy number variation (CNV)of the CXORF2/TEX28 gene in 5 families segregating X-linked high myopia with cone dysfunction, and found that affected individuals from 4 of the families had either a greater (4 or 5) or fewer (1) number of copies of CXORF2/TEX28 than the 3 copies found in unaffected individuals. Metlapally et al. (2009)  suggested that CXORF2/TEX28 gene CNVs appear to be associated with the X-linked myopia and cone dysfunction phenotype. Ratnamala et al. (2011)  described 2 large multigeneration Asian Indian pedigrees with isolated, nonsyndromic myopia in which the condition appeared to segregate as an X-linked recessive trait. The degree of myopia was variable in both families, ranging from -6 to -23 D (mean, -8.48 D). Only males were affected. Onset occurred between ages 4 and 12 years. No other associated visual anomalies, specifically color vision defect were reported (?) in any member of either pedigree. From previous research works it seems that CXORF2/TEX28 gene CNVs could be associated with the X-linked high myopia + cone dysfunction phenotype also in absence of color vision defects. On the other end, during the same years, Michaelides et al. (2005)  described 4 British nonconsanguineous families with an X-linked cone dysfunction syndrome associated with myopia similar to the disorder in the Minnesota family described by Young et al.(2004). Affected members had moderate to high myopia, astigmatism, moderately reduced acuity, normal fundi, and protanopia. ERG showed abnormal cone but normal rod responses. Psychophysical testing showed a selective impairment of long (L) cones in combination with well-preserved middle (M) cone and short (S) cone function. In previous study Michaelides et al. noted that one of the BED families segregated for the known deleterious Cys203Arg substitution encoded by exon 4.11 This mutation could account therefore for the observed cone dysfunction if expressed in a sub-set of cones in the affected individuals. In contrast, they were unable to find any deleterious point mutations in the L and M opsin genes in the remaining families examined. In 2014 their new study has not only re-examined the opsin genes in these families, but has extended the analysis to the original BED family, 4 the Minnesota family, 3 and a new UK family; in all cases, a rare combination (haplotype) of amino acids, either LVAVA or LIAVA specified by codons 153, 171, 174, 178, and 180 of exon 3 of the L opsin gene, is present, a combination that has not been previously reported in more than 300 L or M opsin genes or in separate studies of the L and M genes in a large number of dichromats. These two variant haplotypes would appear to be restricted therefore to individuals that have been diagnosed with either BED or a similar cone dysfunction. Sequence and gene order analysis of the L and M genes present in the different BED families investigated in this study demonstrates that in many cases, multiple genes are present within the array. However, where studied, the upstream or proximal gene encodes one or other of the variant haplotypes. An earlier study of blue cone monochromacy implied that these variant combinations of amino acids give rise to non-functional pigments; if this is also the case for BED, then dichromacy could arise from the expression of a non-functional pigment from the proximal opsin gene in the array, with the type of dichromacy dependent on the spectral characteristics of the functional pigment expressed by the second gene in the array. A constant feature in all BED families is myopia. The genetic basis for myopia has been the subject of several recent studies. A number of genetic loci for high-grade and moderate myopia have been identified, mostly from studies of family pedigrees and many of these have been replicated in an international collaborative whole genome study of myopia. Amongst these is the MYP1 locus (OMIM number 310460), which maps to the tip of the X chromosome at Xq28. It was first identified in the original BED family and a recent study in China has confirmed its location to chromosome Xq28 within 6.1 cM region between marker DXS8069 and Xqter. The study however failed to find mutations in four candidate genes selected on the basis of expression in the eye and absence of other disease associations; the opsin genes that also map to this region of the X chromosome were not screened. It seems nowadays established that opsin gene variation is responsible for both cone dysfunction and the color vision defect. Since myopia is an integral component of the BED syndrome, it would seem likely that this must also arise from the dysfunctional cone photopigment and the disruption of the normal cone mosaic but how this results in myopia remains uncertain. It has to be noted that myopia is a common feature also in Blue Cone Monochromacy. 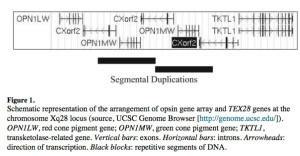 Mutations in the OPN1LW and OPN1MW cone opsin genes underlie a spectrum of cone photoreceptor defects from stationary loss of colour vision to progressive retinal degeneration. Disorders can be grouped into three classes: deletions of the Locus Control Region (LCR); missense mutation (p.Cys203Arg) in an L/M hybrid gene; and exon 3 single nucleotide polymorphism (SNP) interchange haplotypes in an otherwise normal gene array. Moderate to high myopia was observed in all mutation categories. Individuals with LCR deletions or p.Cys203Arg mutations were more likely to have nystagmus and poor vision, with disease progression in some p.Cys203Arg patients. Three disease-associated exon 3 SNP haplotypes encoding LIAVA, LVAVA or MIAVA, were identified. Patients with the last type of were less likely to have nystagmus but more likely to show progression. The haplotype LIAVA has been shown to result in exon 3 skipping. Haplotypes LVAVA and MIAVA also result in aberrant splicing, with a residual low level of correctly spliced cone opsin. The OPN1LW/OPN1MW:c.532A>G SNP, common to all three disease-associated haplotypes (LIAVA; LVAVA; MIAVA), appears to be principally responsible for this mutational mechanism (splicing). The apparence of Borholm Eye Disease (BED) or Blue Cone Monochromacy (BCM) depends on how many copies (only 1 for BED or more for BCM) the patient has in his opsin gene cluster, and which exon 3 SNP haplotype the affected individual has. Patients who have a single red or red-green hybrid gene, and a deleterious haplotype like LIAVA or LVAVA will show the BCM phenotype. The LIAVA/LVAVA and other genotypes result in missplicing of the opsin mRNA, and a non-functional opsin. Buena-Atienza et al . Patients who have two or more copies in the cluster, and only the first L-gene in the cluster or only the first M-gene has the deleterious SNP haplotype show the Bornholm Eye Disease phenotype. One could consider them protanope (or deuteranope if the second gene would be affected), but whit this kinf of mutation (SNP) it seems that the phenotype is not only color blindness, by a (often) progressive cone dysfunction / cone dystrophy phenotype with high myopia and dichromacy. More clinical studies are needed of such patients to fully understand the disease and disease course. Winderickx J, Sanocki E, Lindsey D, Teller DY, Motulsky AG, Deeb SS,’Defective colour vision associated with missense mutation in the human green visual pigment gene’. Nat Genet. 1992;1:251-266. Chen Y-T, Iseli C, Venditti CA, Old LJ, Simpson AJG, Jongeneel CV,’Identification of a new cancer/testis gene family, CT47, among expressed multicopy genes on the human X chromosome’. Genes Chromosomes Cancer 45: 392-400, 2006. McClements ME, Neitz M, Moore AT, Hunt DM,’Bornholm Eye Disease Arises From a Specific Combination of Amino Acid Changes Encoded by Exon 3 of the L/M Cone Opsin Gene’. ARVO Annual Meeting Abstract (2010) Volume 51, Issue 13. McClements M, Davies WIL, Michaelides M, Young T, Neitz M, MacLaren RE, Moore AT and Hunt DM, ‘Variations in opsin coding sequences cause X-linked cone dysfunction syndrome with myopia and dichromacy’.